Barbara Trebbi Landry is President of BXT Corp., a privately held management company with expertise in global public equities, fixed income, real estate, and alternative investments. She is also Director of BrightSphere Investment Group plc, (NYSE: BSIG) a global, multi-boutique asset management company with $240 billion in assets under management serving institutional investors around the world. Barbara was a General Partner and co-managing partner at Mercator Asset Management, L.P. from 2000 until 2017. She started her career in 1988 as an international equity research analyst at Mackenzie Investment Management Inc. and progressed over 12 years to become head of international equities. She has more than 30 years of international investment experience. 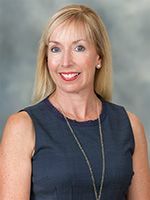 Barbara is a Chartered Financial Analyst and a member of the CFA Institute and also is a member of the CFA Society of South Florida, where she was President from 1994 to 1995. She serves as a trustee of Pine Crest School and Nova Southeastern University and is a member of the North American advisory board of the London School of Economics and Political Science. She received a Graduate Diploma from the London School of Economics and a bachelor's degree from the University of Florida. Barbara and her husband Michael are the proud parents of Michaela, who is a member of Pine Crest School’s Class of 2023.